Body of secrets : anatomy of the ultra-secret National Security Agency : from the Cold War through the dawn of a new century · One Book. One Author. One Hour. Notes from front flyleaf: "Foreign Intelligence Advisory Board; Institute for Defense Analysis. - NSA - 1952. - Crypto City, p. 481; 60 buildings. - Armed Forces Courier Services: a million pounds of material each week marked 'Top Secret' (all intel. services). - NSA: 60 million pounds a year. - Revolving door, p. 523." - A few annotations by Brian Lamb in the margins and underlining of pertinent phrases throughout the book. - Examples: p. 5: "We're the largest and most technical of all the [U.S. intelligence] agencies. We're the largest in terms of people and we're the largest in terms of budget..." - p. 383: "Powerful congressmen were treating Bobby Inman as the dark prince of intelligence, an infallible all-knowing wizard." - p. 384: "The NSA is mandated to collect intelligence, not analyze it." - p. 495: "No phones, however, connect the director to the White House." - p. 549: "The addition of two new operations towers provided the agency's headquarters complex with more space than eleven New York City World Trade Centers." 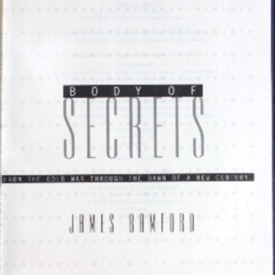 Bamford, James, “Body of secrets : anatomy of the ultra-secret National Security Agency : from the Cold War through the dawn of a new century,” One Book. One Author. One Hour., accessed April 24, 2019, http://booknotes.gmu.edu/items/show/516. This scrupulously documented account of the NSA's tireless hunt for intelligence dissects an organization that monitors enemies and allies alike--a leviathan whose influence has both prevented and provoked world conflict. Relying on testimony and documents never meant for the public eye, Bamford reveals espionage activities and profiles the commanders and the soldiers responsible for the covert activities performed by this clandestine agency. A major work of history and investigative journalism, Body of secrets is a riveting analysis of this powerful agency's history and its future. "United States. National Security Agency--History."